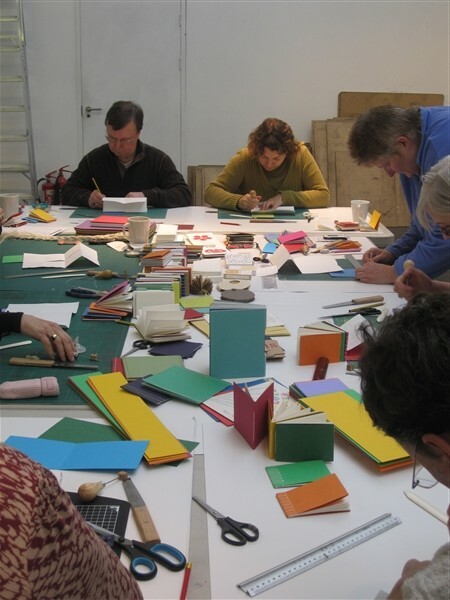 This weekend we ran two bookbinding workshops with Bristol based printmaker and book artist Tortie Rye, on Saturday it was non-adhesive and then adhesive hard back book binding on the Sunday. As always Tortie had some beautiful books and printed items to show us and we all managed to produce something vaguely like them by the end of the day! We are excited to be asked to help Damian Fennell curate the Drawimg tent at Art in Action this year, the event runs from from Thursday 15 July to Sunday 18 of July 2010. If you haven't been before, you're in for a treat, there are literally hundreds of artists demonstrating their expertise in Painting, Sculpture, Drawing, Printmaking, Ceramics, Calligraphy, Illustration, Glass, Metalwork, Jewellery, Nature in Art,Textiles and Woodworkwith many practical classes to get hands on with. We will be taking four artists from the school who will be showing work and demonstrating. They'll also be running masterclasses at points throughout the weekend. Ros Ford who will be demonstrating using sketch books and other visual materials to create larger scale drawings using mixed media. Carol Peace, a sculptor who could not work without drawing, and who has appeared three times in the last five years in the Sculpture tent at Art in Action. The process of drawing for her is about learning, gathering information and an intuitive response to life. Ruth Wallace who makes large-scale drawings in charcoal and mixed media which explore memories and traces of the past. She will be demonstrating some of the techniques she uses. Figure artist Helen Frost seeks sublime gestures; where the intense emotional experience of gesture transcends the personal, becoming universal. She creates drawings that connect to our shared humanity through the language of the body, capturing a fleeting glimpse of energy and presence.